Join us for this kick-off event for our winter reading program with some after hours fun building forts at the library! 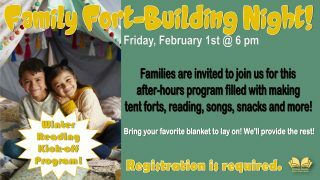 Families are invited to join us for this after-hours program filled with making tent forts, reading, songs, pizza, snacks and more! REGISTRATION IS REQUIRED. Please bring a blanket to sit on and a flashlight, we’ll provide the rest of what you’ll need to build your fort. Contact the Children’s Department to register or for more information.